It's been a while. Around a week to be specific. In case you weren't aware, my laptop and camera aren't functioning, so I'm using my iPhone for everything. That being said, here's my May Ipsy bag. 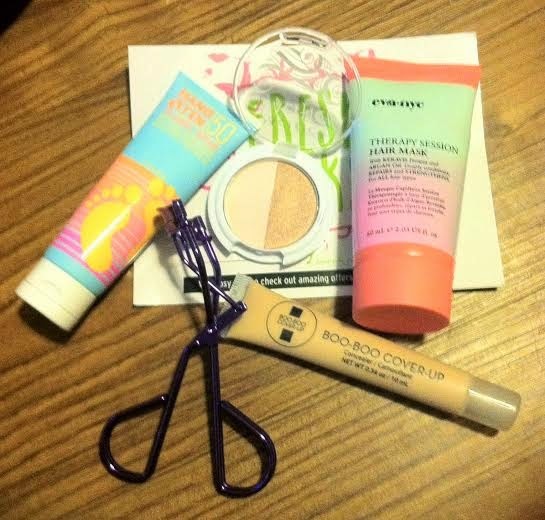 Ipsy is a monthly subscription service. It's $10 per month in the US and $12 per month in Canada(I think!) Each month you will receive 4-5 deluxe sample/full size products. To sign up, go here! Sorry for the blurry picture, I'm still getting the hang of using my iPhone for pictures and it's not going well. Hang Ten Sun screen SPF 50. The full size retails for $12.99; this is 1 fl. oz. I haven't tried this yet, but I'm going to take it to the beach with me next month. Eyelash Curler from Swissco. This retails for $5. I haven't tried it yet either. Pacifica Mineral Eyeshadow Duo in Celestial and Opal. This was a special release for Ipsy only, so I don't know a retail price. I'll post a swatch below. Boo-Boo Cover Up in Medium. I believe this is full size and retails for $20. Eva NYC Therapy Session Hair Mask. This is a sample size & the full size retails for $40. 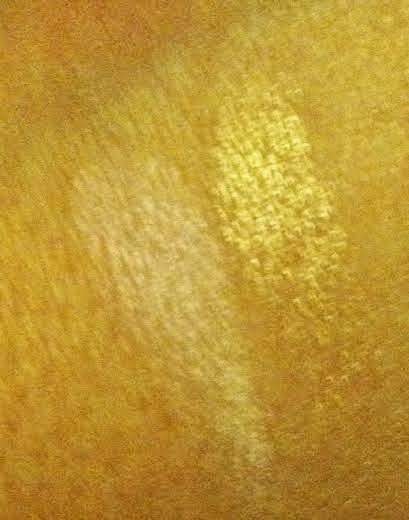 It's hard to tell but the Opal is a light pink with a pink/purple shift, and Celestial is a very shimmery golden shade. I don't know the exact value of this bag but I'm happy with it. I'm mostly excited to try the new hair mask. What did you get in your bag? If you want to join Ipsy, go sign up here! It's time for my monthly Ipsy post! In case you were wondering, Ipsy is a monthly subscription service, you receive a bag every month containing 4-5 deluxe or full size beauty products. It costs $10. shipping is free & it's available to the US and Canada. This months theme is "The Look of Love"
I love this months bag! It's hot pink with a white zipper. Now, let's get into the contents. POP Beauty Plump Pout in the shade Peony Petal. This is a pink shade, but I haven't tried it yet. It retails for $16. NuMe Intense Renewal Mask: It's essentially a deep conditioner. I can't say how much this costs, because the NuMe website isn't working for me. City Color Be Matte Blush in the shade Fresh Melon, I was hoping for Toasted Coconut, but oh well. This is full size and retails for $2.99. Eyetini Cordial Cream Shadow + Base in the shade Spiced Rum. This is supposed to work as an eyeshadow or a base. This is full size and retails for $18. Zoya Nail Polish in the shade Odette. It's a dusty-purple shade. This is full size and retails for $9. Overall, I'm not really all that excited over this months bag, and I haven't been in a few months now. It seems that we keep getting the same brands over and over (Pop Beauty, Be a Bombshell, Nailtini/Eyetini, Mica Beauty, Starlooks, Cailyn) I'm not really going to complain, because it is only $10 a month, but I am considering unsubscribing. Unless some new brands are picked up soon, I think I'll change to a different subscription service. That being said, I think Ipsy is a great beauty subscription service, especially for people who either are just starting out, expanding your collection or just want to try new brands. If you'd like to subscribe, go here. I purchased this mascara in an IpsyMe offer. Let me explain what that is before I get into the review. If you are subscribed to Ipsy's monthly service, you'll receive 4-5 deluxe sample/full size products each month for only $10, shipping included. In addition to this, there is usually as least 1 IpsyMe offer, where you'll be offered products with a special discount. They are typically in very limited quantities, so you must act quickly. To subscribe to Ipsy, click my link & sign up! It's really a great service. Yes, my link IS an affiliate link. Each time someone subscribes through my link, I receive points & I can trade the points for additional items, so I do appreciate it when you use my link! So, this is the first IspyMe offer I've taken advantage of, and it was for the Benefit They're Real full size mascara and a sample size of the Benefit Bad Gal Lash mascara for $23 with free shipping. Benefit Bad Gal Lash claims to make your lashes look like false lashes. That's quite the claim. It comes in a black tube with a silver lid & hot pink writing on the tube. The packaging is cute, but nothing special. The brush is HUGE. I mean, HUGE. Much bigger than it appears on the website. It's almost as big as my eye, okay? With a brush this large, application can be a bit tricky. The formula seems pretty wet, but the brush doesn't seem to hold much product. I like to apply this by wiggling the brush back and forth on the lashes, base to tip, and then for the last coat, I'll just brush straight through to try to remove clumps. The brush being so large makes getting the inner corners nearly impossible, and the bottom lashes are very difficult. I find that this mascara does not live up to the hype. Is it a bad mascara? No. Does it make you appear to have false lashes? No. It gives a little volume and doesn't do much for the length. If you're not careful it gets clumpy. It's better for a natural lash look, in my opinion. The full size it $19, so if you're really wanting to try this mascara buy the trial size at $10 first to make sure you're going to like it. I can say with this mascara, I can easily find a drugstore one that I like more than this. L'oreal Carbon Black Voluminous mascara is still one of my favorites, much better than this mascara and only $8. Please keep in mind that mascara is different for each person! Everyone's lashes are different, as are your preferences and expectations! I also reviewed the Benefit They're Real Mascara, so go check out that review as well. Have you tried this mascara? Do you like it? Do you plan to purchase it in the future?